Home / Online Banking / Paypal internet Banking Now in Nigeria, What Next? Paypal internet Banking Now in Nigeria, What Next? Hurray!, Paypal now in Nigeria. Before I get started with today's thread, I would like to brief you guys about paypal, because I know that most internet users don't really know much about Paypal. Paypal is a form of internet banking or an international e-commerce business, that allows payment and money transfers to be easily made through the internet. In other words, with paypal service, you can pay, easily send money (Both foriegn and local transfer), and accept payments without exposing your finiacial details. It's also known as the most secured internet banking business that enables you pay with flexibility (through the use of debits and credits card), and it's transaction means is the fastest. 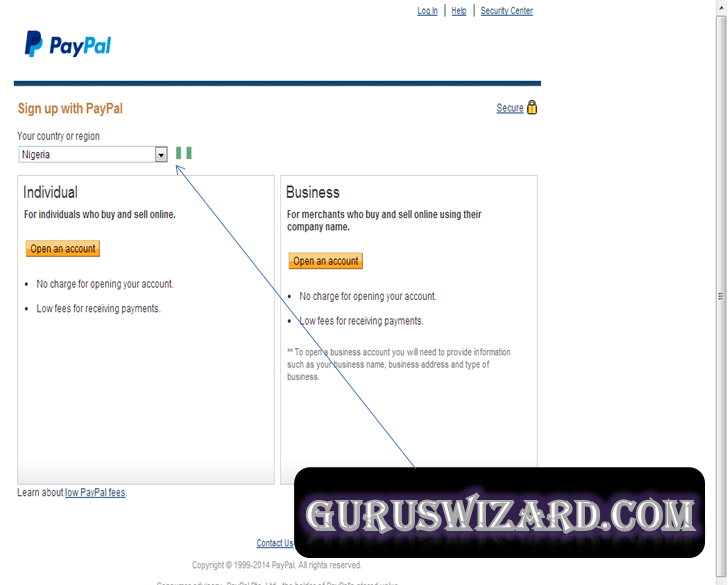 Lately, there was a controversy about the restriction of the Nigerians from using paypal. Most Nigerians (Especially tech bloggers) did signed a petition against that controversy at this page, and now, we are happy to inform you guys that the paypal internet banking is now avaliable in Nigeria. 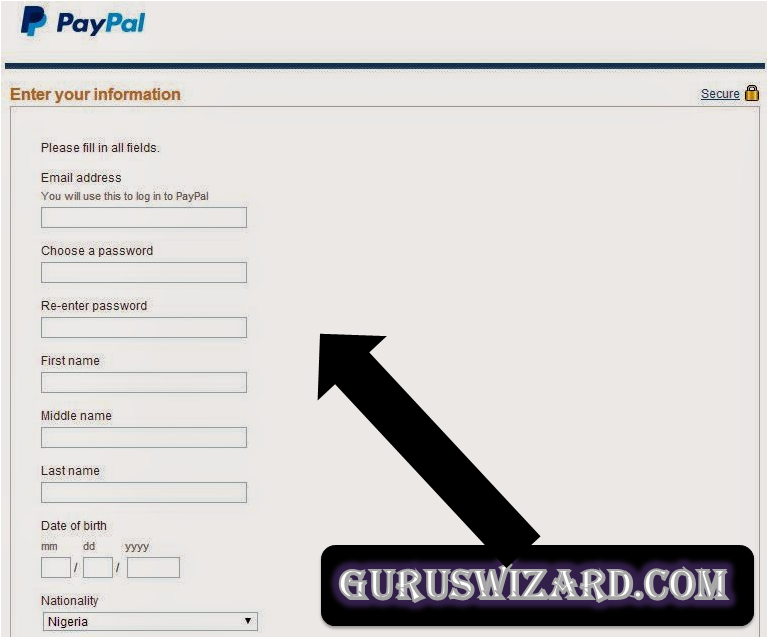 Step 1: First go to Paypal website, then Follow the sign-up link. You would see something similar with the image above, then make sure that the country or region is set to Nigeria, then click "open an account" in any of the account type that best suits you, either the individual or business account. Step 2: Once you've clicked on Open an account, like mine, I used an Individual account type, then simply fill in the form provided, just as it is in the image below. Step 3: After filling the form, then proceed to the next stage of registration, and verify that you're a Human. In this stage of verification, you would simply input the image text in the box and click continue. Step 4: In the next stage, we are to fill in our debit card details, I would do advice you skip the stage and click on My account. NB: Go to your email inbox or spam folder to verify your email address before you proceed to the next step below. 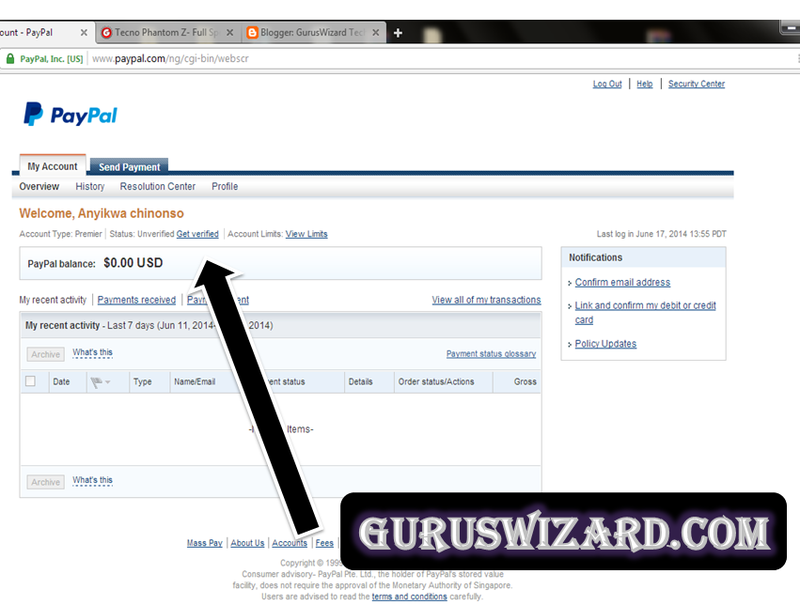 Step 5: This is the final step, without this step, your paypal account would stand to be useless. So, at this stage, you would be linking your debit card details, prefareably, your Mastercard or Visa card. When you go to My account, then click on Get Verified. You would be directed to a page, where you are to fill in your debit/credit card details. Just make sure you've upto #500 in your account, because paypal would use $1.95 to verify is the account is yours, and the refund your cash within the next 24hrs. Congratulations. Your Paypal account would be active once the above procedure is completed. At this point, you're free to perform any transaction online, you can now go as far as getting goods/services directly from Amazon, Ebay, Fiverr and so many online industries. Hope this helps? If you got any related issue concerning paypal management, pls'd let us know, and we would be happy to assist you. my pc hp 650 which is 64bit, is hard disk got crashed but on getting it repair from an enginer the system bit change right from 64bit to 32bit and my graphics index drop down right from 4.5 to 1.0. and it coudnt even play GTA again. please I need a full tutorial on how to change my pc back to normal. Check ur atm card, You would see if it's mastertercard, verve e.t.c. First select Niger and wait for some min. Another form will appear.